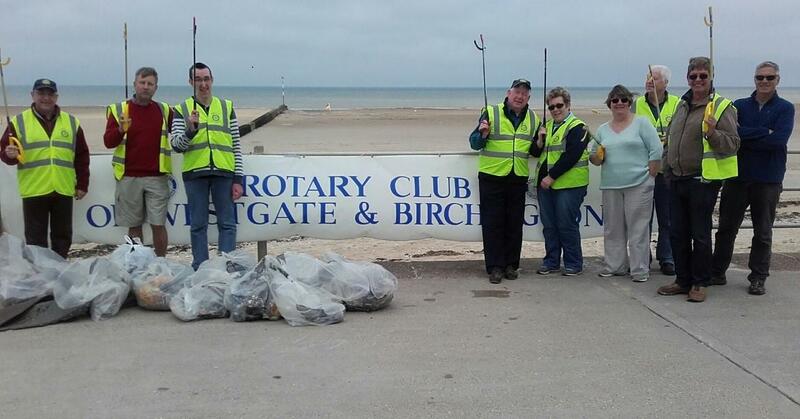 A group of Rotarians met at the "Brightling Beach Hut" to join forces with Karen & Brian from "BAG" (Birchington Anti-litter Group) to pick up flotsam & jetsam from the beach. "BAG" supplied all the participants with mechanical "litter-pickers" and Thanet District Council supplied the rubbish bags. At first sight, the beach looked pretty clean but closer inspection revealed masses of plastics litter, much of it hidden within the light covering of seaweed. Happily, there were very few dangerous items; A few jagged pieces of hard plastic were enbedded in the sand as well as very sharp pieces of aluminium drinks cans. Mostly it was quite old discarded food and drinks containers and gave a clear illustration of the problems caused by non-biodegradable plastics in the environment. In all, fifteen bags of rubbish were collected and lots of people on the beach and on the promenade thanked the volunteers for making the beach safer for them. After an hour an a half of litter-picking, everybody met up again Chez Brightling-Hut and enjoyed a welcome cuppa and delicious Eccles Cakes made by Loraine.